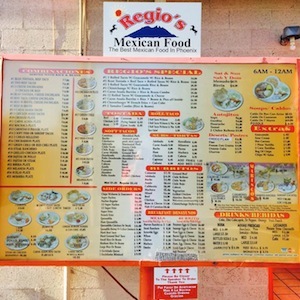 For Breakfast Lunch, Dinner or Late Night Food, Regio’s Mexican is a Central Phoenix hidden Gem. Our years of Yelp and Google reviews online, in local newspapers. We invite you and your friends to join us daily for lunch specials that will leave your stomach and your wallet full. When the sun goes down Regio’s Mexican Food serves traditional Mexican food until 12PM, 11PM on Sundays. Being a Phoenix local small business we enjoy our neighbors and feed you like you are family. 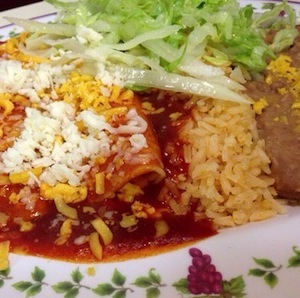 Take a picture of your Lunch or Dinner at Regio’s Mexican Food Restaurant and post it to Facebook!! Daily Specials for dine in and carry out orders. With our fast service your food will be hot when you get home! Thanks to Louisa M from Yelp for the picture!$6.99 and UP!!. Get your order hot and ready quick at Regio’s Mexican Food. Our drive thru is open from 6AM to 12PM, except Sundays. 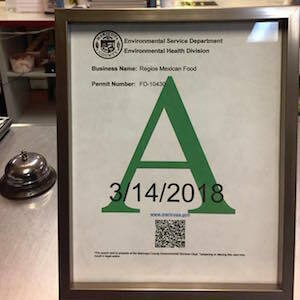 Another A Rating Health Inspection! We want our customers to know we have outstanding food and a clean kitchen. Here is the proof! We enjoy providing Fresh, Quality ingredients in all of our Traditional Mexican Dishes. We want you to truly feel at home when you dine with us and have a hot meal when you carry out. We keep our prices fair so you can afford to eat here multiple times a week. See you soon!